Spanish F1 Grand Prix with a little extra! Due to an increase in enquiries about Hospitality packages at the Spanish Grand Prix, we’ve been in contact with a number of the leading suppliers to see if they can assist with finding the best package at the best price. There’s a wide choice of options at the Circuit de Barcelona as you can see below. If you are interested in booking a Hospitality package and would like some help, please use the contact form and we’ll see what our contacts have available. We won’t share your contact details until you’re ready to enquire further about a certain package. Package prices change wildly so please share your budget so we can choose the best options to meet your needs. There have been some changes to the Piso boxes since 2016 with a number of them being knocked through to increase the size of the F1 Paddock club. This has affected some of the providers offering individual Piso boxes for corporate entertainment. However, there’s still plenty of choice with budgets starting from £696 per person. This package includes a combination of a Grandstand seat with access to a private members area for catering and drinks, including alcohol. Alcohol is only available in hospitality locations. Your seat will be in Grandstand I which is on the last corner of the circuit at the beginning of the start/finish straight. This package also includes a parking space when you purchase a 3 day package. This is a new hospitality package for 2017 and is located in the main grandstand on the start/finish straight. The Gold Suites are located on the first floor and have views across to the pit lane and garages. The suites allow access up to 45 guests and so ideal if you’re looking to arrange some corporate entertainment. Packages can also be booked for smaller groups and individuals. A 3 day package includes a seat in main Grandstand and Gold Suite access for Saturday and Sunday. There is a Tapas menu and drinks are included for Saturday and Sunday. A parking space is also included in the main car park opposite the Grandstand. Red Bull have improved their hospitality packages and now offer packages at most Grand Prix’s. The Red Bull package for the Spanish Grand Prix includes access to the Paddock Club directly above the Red Bull Garage. As well as the package giving the normal first class treatment you would expect, including Gourmet Lunch and exclusive Red Bull bar champagne, fine wines, beers and Red Bull energy drinks there’s also chance to meet some of the team and have a tour of the Red Bull Garage. 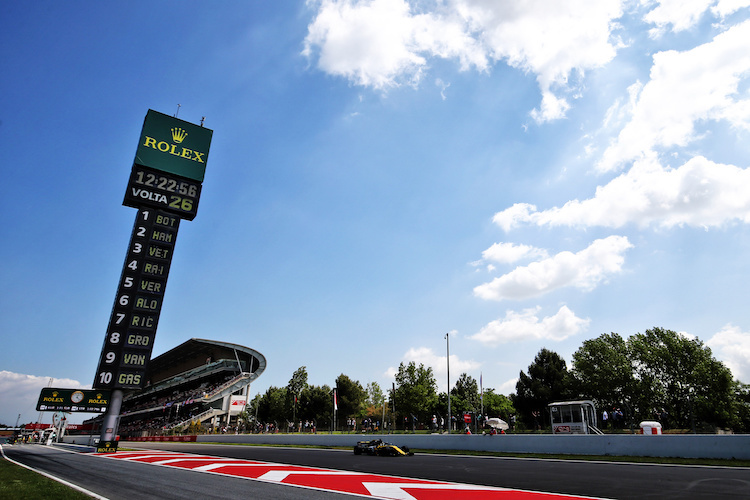 With the added bonus of almost guaranteed weather and being only 40 minutes from Barcelona, one of the world’s most lively and beautiful cities, the Spanish F1 Grand Prix is one of the best of the European races to attend.